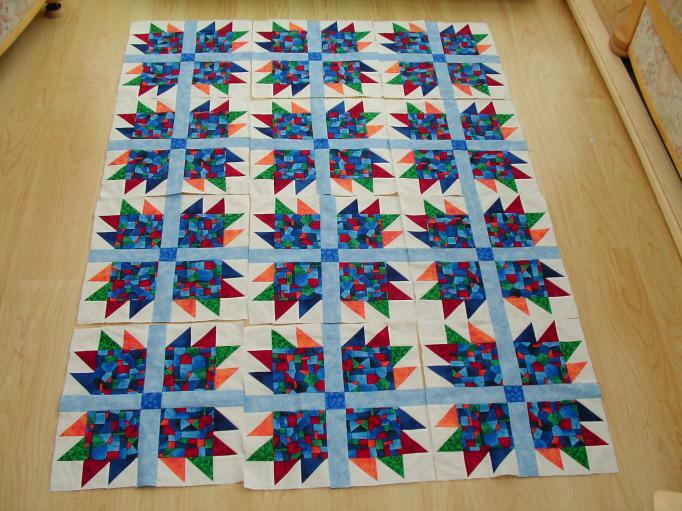 I want to finish this quilt this year. The pattern is called Bears in the Farmhouse, and it was designed by Judy Laquidara. A group of us made this pattern as part of a Quilt Along several years ago, and I found it again last week while looking for something else. The top is complete, just needs batting, backing, quilting and binding. This week I have been trimming string blocks for my daughter Amber’s new quilt. This may take some time! I’ve made 96 blocks, 12 each of 8 colours. They are 9.5 inches square after trimming, to finish at 9 inches. Katy is looking at them. Amber wants a large quilt for her bed, and I’m trying to figure out how many blocks to use and how they will be arranged. My inspiration for this quilt came from this cute table runner designed by Barbara Groves and Mary Jacobson at Me and My Sister Designs. Just under the wire, too — the deadline is today. Whew!